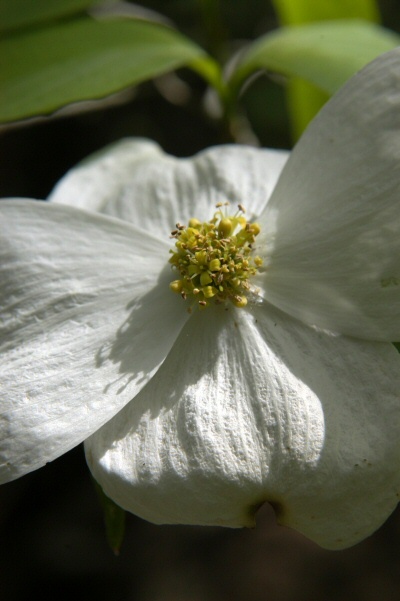 NATURAL HABITAT AND PREFERRED SITE: Flowering dogwood grows primarily in the deep, sandy acid soils of deep East Texas, the Pineywoods, and Post Oak Savannah in sun to part shade. Can be grown in landscape gardens around the state with very intense bed preparation that includes high levels of compost and other organic amendments. IDENTIFICATION INFORMATION: Flowering dogwood is a beautiful ornamental tree for use in formal or natural gardens that has beautiful spring flowers, attractive foliage, beautiful fall color, red berries and fat flower buds that are prominent on the end of the twigs throughout the winter. Graceful layered structure and pink or white flowers in the spring. FLOWERS AND FRUIT: Flowers are on display before most other trees have leafed out. Tiny greenish yellow surrounded by 4 white and sometimes pink showy bracts up to 2 ½ inches in length. Fruit ripens in the fall and persists over the winter as tight clusters of shiny red oval droops about 3/8 inch long containing one or 2 seeds, inedible and somewhat toxic. BARK: Reddish brown to gray becoming darker and almost black on older trunks with a distinctive checker board of square blocks and shallow furrows. Wood is very hard and close grained and is used to make spindles, pulleys, tool handles and jewelry boxes. FOLIAGE: Leaves are opposite, simple, deciduous, red fall color 2 to 5 inches in length, smooth margin, dark green above, paler to almost silvery under surfaces, curving leaf veins paralleling the margins. 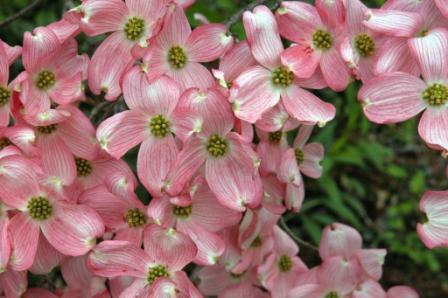 CULTURE: Flowering dogwood is fairly easy to grow as long as the bed preparation is good and the soil remains moist. In the black and white soils and other alkaline soil areas the beds should use double the normal bed preparation amendments that I recommend including 8 inches of compost, 1 inch of Texas greensand, 2 inches of lava sand, ½ inch of earthworm castings and the beds should be mounded so that the drainage is positive. 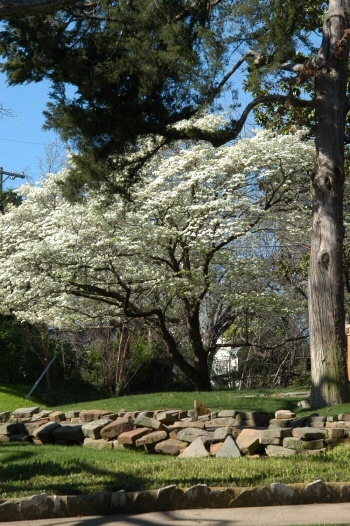 Flowering dogwood responds well to the gentle organic fertilizers. Needs moist soil but also very positive drainage. PROBLEMS: Problems include cotton root rot, soil alkalinity, borers, dry soil and improper bed preparation and planting. PROPAGATION: Dogwood is grown from seed which should be hand picked in the fall, the hulls removed by maceration or washing away the pulp. Seeds should be stratified in sand or peat for at least 30 to 90 days at 41 degrees and planted in April or early May. 1 year old seedlings can be transplanted to final sites. It is also propagated by layering, root cuttings, and divisions. Dogwoods will root from softwood or semi-hardwood cuttings taken in late summer, hardwood cuttings taken in the winter and by suckers, divisions and layers taken in the early spring. INSIGHT: Pioneers realized they had good soil for growing crops if dogwood was found growing wild. Many species of birds and other wildlife feed on the fruits. Would not be considered a low maintenance plants. This tree is native to acid, sandy soils like those in east Texas. Many improved cultivars available. ANSWER: My guess is that the tree had a dry root ball when it was planted. Drench the root zone with Garrett Juice and add an extra ounce of molasses for each gallon of solution. Getting a dry root ball moist is not easy. The story goes that when Jesus was awaiting crucifixion and when the crosses were being made the trees begged God to spare them, but the Dogwood begged not for it's life but for the life of Jesus. The Roman soldiers picked the Dogwood. The Dogwood pleaded with God to use another wood but God did not intervene. The Dogwood would now carry the body of Christ to his death and the Dogwood knew that for all eternity Dogwoods would be known for this horror. God in his wisdom spoke to the Dogwood and understood the tree; in that time Dogwoods were tall straight trees that provided sturdy timber for homes and vessels, safety for the animals. bowls for food, utensils to cook with; and God spoke. God told the Dogwood that the burden that was carried would be carried only one time, and from that time on Dogwoods would be knarly small trees with poor timber size so not Dogwood could be used in this manner again, God told the Dogwood that the Dogwoods would now be responsible for eternity to help people remember. And so it is today, the Dogwood is a small twisted tree, it blooms at Easter and the flower....well look for yourself.